My work travels recently had me spending the better part of a week in downtown St Louis. For those of you that aren’t already shaking your heads, there doesn’t really seem to be much in downtown, especially food-wise. Sure, some of the neighborhoods like Soulard actually have some nice restaurants, but downtown itself is mostly Hooters, TGI Fridays, and Max and Erma’s. Not exactly food paradise. But an appeal to the fine folks over at Chowhound.com led me to two places worth checking out that were near my hotel. 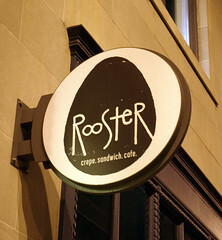 One of them was Rooster, a small cafe that features a wide variety of sandwiches, breakfasts, and crepes. It’s a rather nice little cafe, which is rather surprising, since a large fraction of the street-level real estate in that part of town is vacant. I’m glad this place is an exception. The crepes were what ended up bringing me to Rooster, since a good french-style crepe seemed like exactly the breakfast I was looking for. 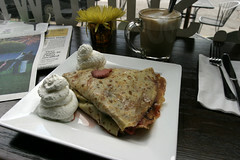 Looking over the menu, I opted for the Nutella crepe with added strawberries. I’m happy I did, the resulting crepe (at right) was firm, with a nice crisp, and very nicely loaded with a layer of nutella, strawberries, and some real whipped cream. Quite a good breakfast, one that was even quite pleasant to look at. The rest of the breakfast menu (mostly various egg dishes) looked formidable as well, and if I was around town longer, I probably would’ve come back..
My name is Dave and I own Rooster. I am so glad that you enjoyed your visit to our little cafe, we strive to do our best. I just wanted to assure you that our strawberries are never frozen we buy them fresh and roast them gently with brown sugar and vanilla. I stand corrected, the strawberries had an unfamiliar texture and I assumed it was from being frozen. I’ll correct the article.